Admittedly, I came into No Way Out a bit jaded with Robert Kirkman and the whole Walking Dead experience. Let’s be honest: At this point, the book is essentially the same thing happening over and over again. Rick and the gang find a new place to stay, or get some kind of new hopeful idea, and eventually it all goes to hell, some people die, and they’re back to square one. It’s like a little kid playing with blocks. It doesn’t matter how high that tower gets, eventually it’s coming down. I came into this book knowing I was going to see everything go to hell again, and I wasn’t especially excited at the prospect of the entire process repeating itself again. But I’d forgotten about the element that, in my opinion, is the key to the longevity of The Walking Dead: The naked humanity Kirkman and the creative team put into the stories. Indeed, this book contains the controversial issue #83, in which something terrible and irreversible happens to Carl. In the latest issue, they printed some of the hate mail the folks at TWD got over it. If you want to put a positive spin on it, it definitely illustrates how passionate the fans can be about the characters who’ve been there since the beginning of the series. Personally, what happened to Carl didn’t surprise me. In The Walking Dead, anybody can go at any time, for better or worse. 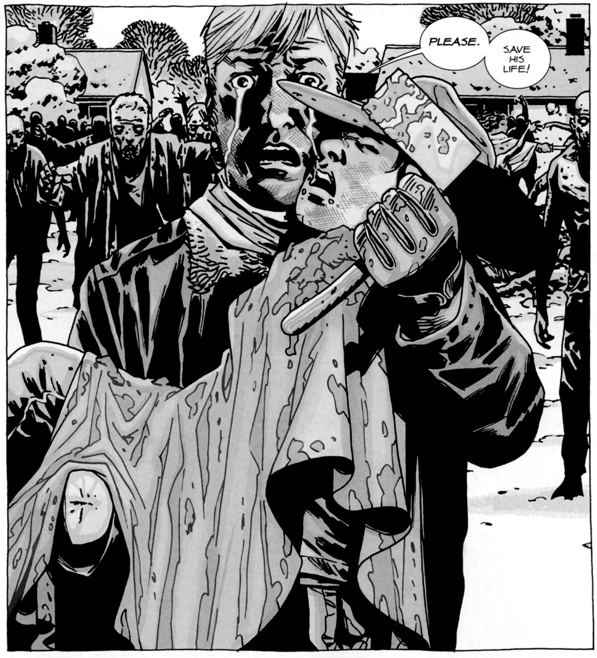 I think a few decisions Kirkman made for the worse happened in the way he handled the Morgan character, both in this book and the previous one. Morgan was the first non-zombie Rick came into contact after he woke up from his coma. At that point, Morgan had a young son, but had lost his wife in the zombie apocalypse. Morgan’s son eventually became a zombie, and had to be killed (again). Rick’s group eventually found Morgan, and he became one of them. For my money, TWD made a mistake in killing off Morgan’s son, and certainly made a mistake in reuniting him with Rick. Morgan was a character we got invested in very early. When Rick and the others found him, we all knew his backstory, and were wondering what he’d gone through since we last saw him. We cared about him. Kirkman could have used this to his advantage. In one of the Walking Dead collected books, Kirkman wrote an exclusive short story featuring Morgan and his son around Christmas time. They didn’t endure anything incredible. We just got a look at what they were up to. If I were Kirkman, I’d have kept doing these short stories not only to give us an occasional treat, but to take us to different locations and give us the occasional break from whatever Rick and the other survivors are up to. The scope of the series could have been widened, if only for a short time. Instead, Morgan became just another member of our regular cast. I sometimes have a problem with our ensemble of characters in TWD, in that it can be hard for me to tell people apart, or remember everybody’s backstory. Rick, Glenn, Andrea, and others who’ve been around since the start aren’t a problem. But newer characters can sometimes be hard to differentiate, especially in the black and white art. “Okay wait, what’s this guy’s deal again? What’s his big trauma/secret?” Things like that. But to an extent, I suppose that’s inevitable when you’re dealing with so many people. I’ve always just pushed through, and it’s gotten me this far. Any one character in The Walking Dead has had to endure multiple heartaches and traumas, the caliber of which the average real person only has to deal with once or twice over the course of their life. In No Way Out, we see two men torn about whether they should fall for other women after their wives have died, we see a man feel terrible remorse for cheating multiple times on his now-dead wife, and we see a man flat out say that he would sacrifice the life of another child for his own on any given occasion. That’s pretty heavy stuff to say the least, and it’s what truly makes The Walking Dead series about people, not zombies. Image 1 from comicsonmynightstand.blogspot.com. Image 2 from walkingdead.wikia.com. Image 3 from zombiediary.com. This entry was posted in Comic Books/Graphic Novels and tagged Carl Grimes, Charlie Adlard, comic book reviews, comic books, Image Comics, Rick Grimes, Rob Siebert, Robert Kirkman, The Walking Dead, The Walking Dead Vol. 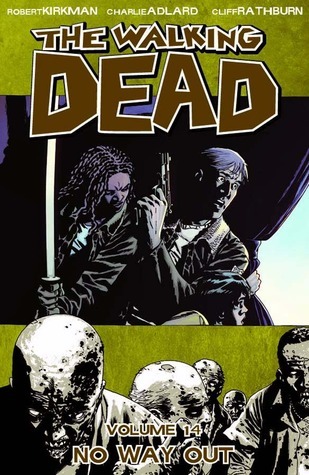 14: No Way Out, trade paperback reviews, zombies on 06/15/2011 by primaryignition.